A superb cruise upstream to Yarra Cliffs seeing the 200 year old canoe tree, ski beach, majestic limestone cliffs and wildlife. 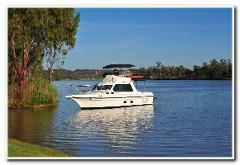 Then cruise back downstream to the Waikerie riverfront while marvelling at the breathtaking landscape. A leisurely cruise downstream to Ramco seeing the houseboat marina, wildlife and the majestic limestone cliffs. Then cruise back upstream to the Waikerie riverfront while admiring the abundant bird life and marvelling at the beauty. 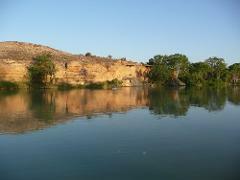 A relaxing cruise downstream to Broken Cliffs seeing the houseboat marina, wildlife and the majestic limestone cliffs. 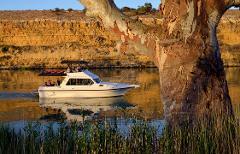 Then cruise back upstream to Waikerie riverfront while appreciating the stunning landscape and abundant birdlife. An unforgettable leisurely cruise both upstream and downstream on board Qatar while sipping on your favourite ale. Watch the sun set on the Waikerie Cliffs, the colours it makes on the horizon and the mirror images on the river. Enjoy cruising both upstream and downstream on board Qatar while sipping on your favourite ale and capturing the beauty of our Murray River.